Or view larger version. 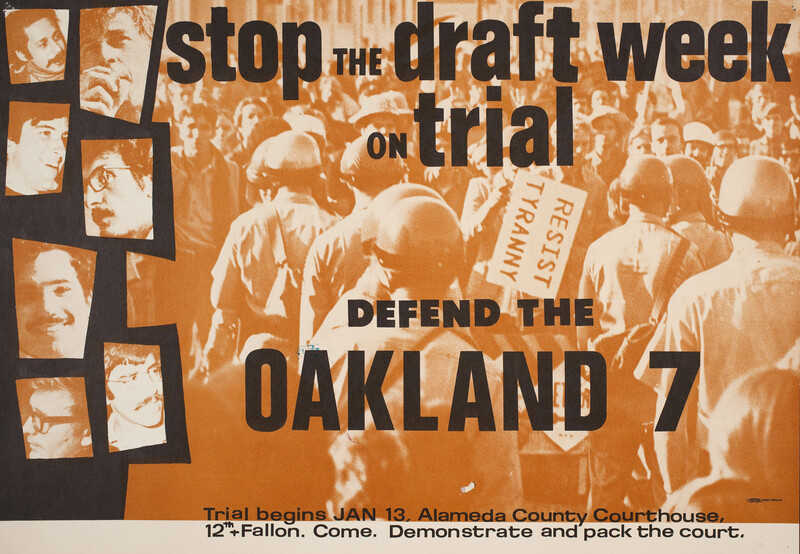 Stop the draft week on trial: Defend the Oakland Seven. 1967. Unknown designer. Poster. Collection of Oakland Museum of California, All of Us or None Archive. Gift of the Rossman Family. This poster collages seven faces on top of a photograph of a riot police versus protestors at a demonstration. On October 16 during the national Stop the Draft Week campaign, over 200 demonstrators blocked the entrance to the Oakland Induction Center; 40 were arrested, and seven were tried for “conspiracy to trespass, to commit a public nuisance, and to resist, delay, and obstruct police officers.” All were acquitted.